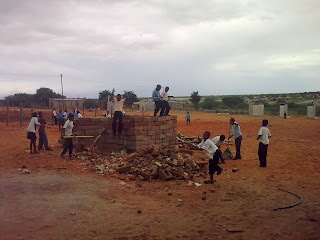 Yesterday the principal had them build a little brick shack for building a fire and cooking when the power goes out, which happens all the time these days. I'm beginning to get the idea that most of the problems at my school are due to the principal. He's not a bad person, but he's a terrible gossip, doesn't teach his classes, and generally fosters an unprofessional atmosphere. For the few classes I've seen him teach (I've counted him in the class three times since I got here) he mostly just sits and chats with the students in Setswana. The reason I mention gossip is that today I was talking with the Grade 8s during a break and they said I should go and visit America. I told them I don't have enough money, and they replied that the principal had told them that I am a "rich man." I told them that the principal is a liar--kinda pissed me off, actually. No one in my village believes that I am actually as poor as them in terms of my income. They all believe that I brought piles of money from America, and the principal's big mouth pretty much guarantees I'll never convince them otherwise. I mentioned this episode to some of the other teachers and they spoke of the principal with open scorn. The few actually dedicated teachers are mostly in the lower grades, and they said that the principal brags to the students about his own salary or tells them how much the other teachers make and other such business. I also got a chance to visit the lower grades, and the discipline was miles better than the upper grades. Apparently having no teacher for years tends to erode discipline. Who knew? No problem, Liz. Hope you don't mind if I do the same.